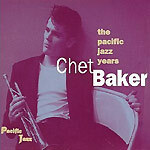 CD review: "The Pacific Jazz Years"
The late trumpeter Chet Baker may not have been especially innovative in his playing, but he was a wonderful stylist. Eschewing the high-octane blowing of the boppers, Baker's forte was nuance. His muted trumpet was a perfect match for the West Coast cool jazz scene he was part of in the 1950s. This four-CD collection takes in Baker's early recordings for Pacific Jazz. While Baker was known as much for his James Dean good looks and his heroin habit as for his playing, these sides show that he was an outstanding instrumentalist who deserved to be known for his playing. As Baker and frequent collaborator Gerry Mulligan were among the first from the California scene to land major label record deals, this collection is also a history of California jazz. As these tracks illustrate, it was a far more sophisticated scene than it is often given credit for.